What is the World’s 50 Best Bars? The World’s 50 Best Bars is an annual list that celebrates the best of the international drinks industry. Now in its 10th year, The World’s 50 Best Bars provides an annual ranking of bars as voted for by more than 500 drinks experts from across the globe. The list represents the ultimate international guide to the world’s top bars and drinking destinations and is revealed at the annual The World’s 50 Best Bars awards event, which in 2018 took place on Wednesday 3rd October at the Roundhouse in London, UK. How are the awards voted for? 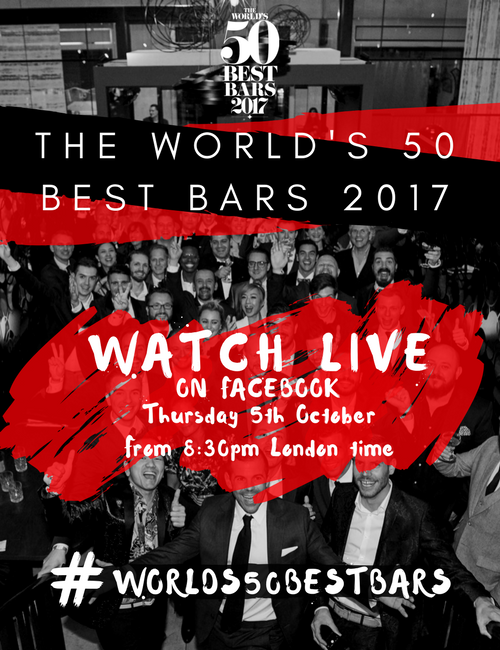 The World’s 50 Best Bars list is compiled from the votes of The World’s 50 Best Bars Academy, comprised of more than 500 drinks experts, including renowned bartenders and consultants, drinks writers and cocktail specialists. Each voter casts 7 votes, based on their best bar experiences of the previous 18 months, of which at least 3 must be for bars located outside the voter’s country of residence. Who are the voters and how are they chosen? The Academy is made up of drinks experts, including bartenders, bar managers, drinks consultants, brand ambassadors, drinks writers, historians and cocktail aficionados. They are chosen by the 50 Best team, aided by its expert network of contacts worldwide, including Hamish Smith of Drinks International magazine and US drinks expert Camper English. The voters are spread across the globe as follows: 150 based in Europe; 140 based in North and Central America; 40 in South America; 115 in Asia; 35 in Africa and the Middle East; and 30 in Australasia. The distribution of voters is designed to reflect the relative development and sophistication of the drinks sector, and the concentration of quality bars, in each region. Are bars encouraged to campaign to voters? No, bars are not encouraged to campaign directly for voters, but of course they should strive to be as good as they can be and market themselves as they see fit. Since 2017, the list of voters has no longer been publicised and, from 2018, all voters are required to retain their anonymity. The votes themselves are logged on a secure online platform and remain confidential. On what criteria are voters asked to make their decisions? Voters are simply asked to name the seven bars in which they have enjoyed the best experience over the previous 18 months, with the proviso that at least three of their choices must be for bars located outside the voter’s country of residence. There are no pre-determined criteria, though there are strict voting rules. Voters must have visited the bars they vote for during the voting period, and they cannot self-nominate or nominate a bar in which they have any financial interest. Guest bar shifts and pop-ups do not qualify for votes. In addition to The World’s 50 Best Bars list, the organisation also publishes the extended 51-100 list and awards a series of special prizes to individuals and bars. In 2018, the list of special awards included a new category, the Sustainable Bar Award. See the full line-up of awards. Why have new awards been introduced and how have they been voted for? The range of new awards is a means of celebrating more bars and bartenders, and diversifying the awards beyond the list itself. Discover the basis for each award. What does it mean to be included on The World’s 50 Best Bars ranking? It provides recognition of the dedication, passion and skill of the teams behind those bars. It also helps promote those bars internationally to well-travelled discerning drinkers, boosting the bars’ profiles and business. Who owns The World’s 50 Best Bars? The World’s 50 Best Bars is owned and organised by William Reed Business Media, the group behind The World’s 50 Best Restaurants, Latin America’s 50 Best Restaurants and Asia’s 50 Best Restaurants. In 2017, William Reed Business Media took over from Drinks International, part of Agile Media, in the organisation of the awards, collating the votes and producing the list. What is the relationship with the previous owners at Agile Media? We continue to work with Agile Media. Drinks International, owned by Agile Media, has taken the role of trade media partner for The World’s 50 Best Bars and Hamish Smith continues to be involved on a consultancy basis. What is next for The World’s 50 Best Bars? We believe The World’s 50 Best Bars can grow to become an even higher-profile brand, not only in the drinks industry, but also among discerning drinkers across the world. We have already published the third edition of the Asia’s 50 Best Bars list, and we aim to continue to grow the brand overall.